In the immortal question of whether or not kids cartoons are better now than when they were in, say, the 90s, I would say, in general, no. There are quite a number of good animated shows today, both critically acclaimed (Steven Universe, The Amazing World of Gumball) and some solid ones that are under the radar (The Loud House, Voltron). If I had to suggest, broadly speaking, the one thing that plagues cartoons today though, is their weird struggle to provide a story that narratively sustains itself for a full twenty-two minutes. Again, I’m definitely speaking in wildly broad terms here, but the animated shows that I’ve been watching (Dinotrux, Puss in Boots, My Little Pony, even this show), upon realizing the plot they’re working with isn’t exactly one that can stretch itself out, are forced to utilize a lot of exposition, belabored jokes, and circuitous dialogue between characters that doesn’t really go anywhere. It’s difficult to fully put into words what I mean (unless you’re watching a lot of the various cartoons I am), but “Warhead” is fairly distinct example of it. Ostensibly, what we’re presented with is a plot in which a few characters don’t like each other, then a deadly being arrives, and said characters join forces to stop that being. It’s cliche, sure, but it’s usually always effective. You get to witness a new twist on some character dynamics while also experiencing a tense, dangerous situation. And this is what essentially happens here. Zeb, AP-5, and Chopper bicker. 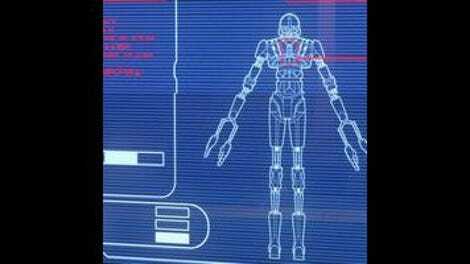 An Empire droid is brought on base, which transforms into a hell of a killer robot. Zeb, AP-5, and Chopper then come up with a plan to stop him and save the base. It’s all good stuff, but the problem is that the meat of this episode maybe lasts five, seven minutes tops? Writer Gary Whitta has been one of the stronger and more reliable writers on the show this season, so it’s a bit baffling to watch the bland, check-list style pacing to this episode, particularly that third act. Most of the Ghost crew fly off on a practice mission, leaving Zeb alone with those two droids, and we’re already on shaky ground. There aren’t any other rebel soldiers around, even a few? Also, we learn that Zeb is head of security, but Zeb’s approach to it is weirdly lackluster and flippant. 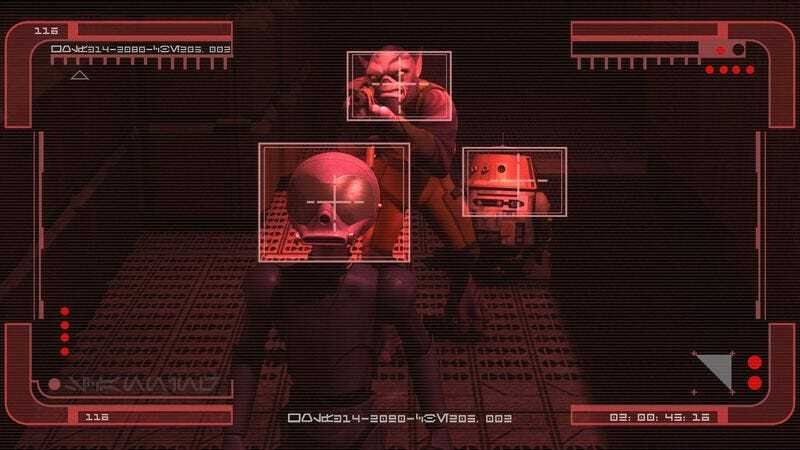 The pinpoint leadership efficiency Zeb exhibited in “The Wynkahthu Job”–also written by Whitta–is nowhere to be found here, especially when he brings a random droid onto the base and has AP-5 activate it. Boredom and conversational annoyance are the prime motivators for this plot point, but it’s not as if we’re provided character revealing–or even particularly witty–dialogue. AP-5 thinks Zeb is all brawn and no brain, Zeb thinks AP-5 is a nuisance. Also Chopper makes some noises. When the crew inadvertently mentions they’re on a rebel base in front of that awaken droid though–holy crap. The episode explodes with a ruthless, genuinely tense sequence as the robots expands and becomes a vicious hunter–quick, fast, strong, and practically invincible. Director Bosco Ng sinks his teeth into the moment, all dark corners, blackened corridors, and claustrophobic close-ups. He leans into the monstrous iconography: oil leaks as blood trails; destroyed droids as dead bodies; shots of the droid ripping opening machines portrayed like a beast feeding on his victims. It’s good stuff, main even better when Zeb goes one-on-one with the machine. There’s almost the chance that Zeb might not win this one. Zeb finally pins him down, giving AP-5 the opportunity to power it down. And then there’s a whole one-third of the episode left. I mean, sure, there’s the imminent explosion from the robot itself, which could have been a raised-staked moment. But Chopper freezes the countdown, and then… it’s talk. Not panicked talk, or rushed-decision talk–but just talk, specifically on what to do next. Which, I mean, isn’t bad in and of itself, but it makes for a deflating third act, especially since all the well-thought out decisions they make just work out so well. They reprogram the droid to return to the Empire ship so it can detonate there, and there’s not a single complication (well, there’s the brief moment where the droid readies to send a signal to the Empire, but Zeb shoots the dish almost immediately, and there’s goes that potential obstacle). I suppose the appreciative rapport that develops between Zeb and AP-5 is nice, but since Zeb has hardly been used in any significant way this season, and since AP-5 has hardly been used at all this season, this “Warhead” really is a dud. Except that middle act. That rocked. We get to see Kallus, AKA Fulcrum, divulge some info for Zeb, which kind of feels narratively convenient. I mean it’s fine on the surface, but it takes away from Zeb or AP-5’s abilities to figure things out. Thrawn used the old Empire droids to narrow down the potential planets that may host the rebels base. It’s clever but obvious. Still, the Empire searching 94 planets is probably something they can do in a few hours with their resources. But it looks like the upcoming Sabine/Mandalorian arc is going to take precedent. Thanks everyone for the clarification about the still-existent Senate. It was one of those many small details about the Star Wars universe that’s easy to miss. I kind of think Hera, of all people, would have been a bit more skeptical in the idea of said Senate having some sort of authority to respond to the evidence, but things now make more sense overall.